Our annual Fall Fundraiser is just around the corner! 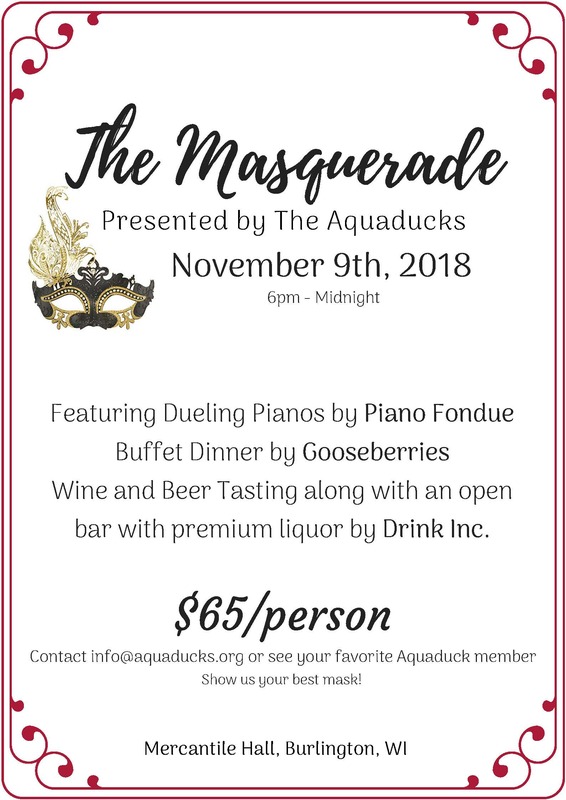 This year’s masquerade themed event will be held November 9th at 6:00PM. Due to unforeseen events, we do have a last minute location change. The event will now be held at the beautiful Mercantile Hall in historic downtown Burlington – 425 North Pine Street, Suite 100, Burlington, WI 53105. We look forward to partying with you soon! We broke another Guinness World Record! 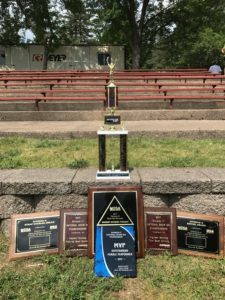 September 16th, 2017, Rock Island, IL, 6 area ski teams teamed up to break their own Guinness World Record for the Largest Human Water Skiing Pyramid Formation. 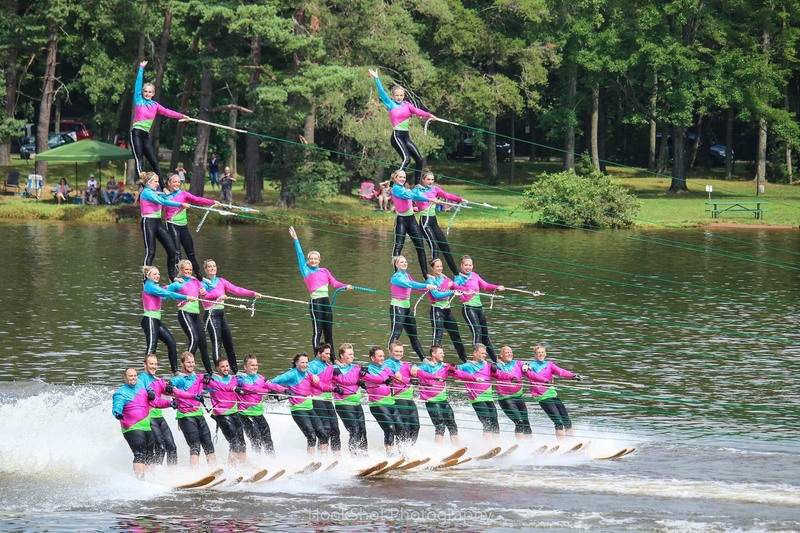 Previously set in 2013 with 60 people behind 1 boat, the Aquaducks and area ski teams successfully built a human pyramid with 64 people behind 1 boat, powered by (3) 300hp Evinrude G2 motors. Show skiers have been attempting to break this record since 2014. After Guinness reviewed the 2017 footage, they successfully announced the new World Record on Monday, August 9th. These ski teams do not plan on stopping here though. This September will host a goal of 72 people in formation, behind 1 boat. 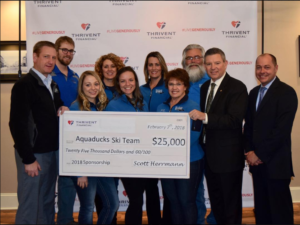 The “Ducks” would like to thank Evinrude for all of their support and power for show ski teams across the nation. Also, a big thank you to the Backwater Gamblers Water Ski Team in Rock Island, IL for hosting, and to everyone who made this new record possible. Celebrate Independence Day with the Aquaducks! 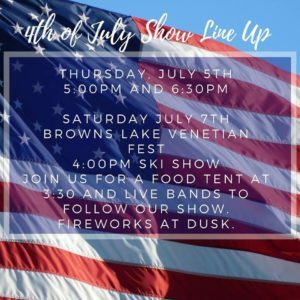 As your finalize your plans for the holiday week, we hope you bring your family and friends out to a free ski show and a beautiful firework show! We are thrilled to announce Thrivent Financial as our “300 HP” sponsor for the next two years, supporting the our large equipment expenses for operations. We have spent the off season rebuilding one of our Hydrodyne boats. We stripped the boat down to its shell, reinforced the stringers, extended the transom 18”, and completed the rebuild with new fiberglass, paint, and decals. (Check out #tow3rebuild ) We are also looking to replace our current inboard, to complete the fleet. These equipment upgrades will allow us to perform with high standards. Our season will kick off this Saturday, May 26th at 6:00pm. The free water ski show will be performed with a Monopoly theme, featuring different attractions throughout the Burlington Community. The show will continue every Thursday at 6:30 from Memorial Day – Labor Day. Thank you to everyone who attended our 5th annual Fall Fundraiser. It was another great night, being entertained by Greg Bach, James Ervin Berry, and our DJ Kurt Sommerfeld. To our corporate tables: Burlington Chiropractic, Thrivent Financial, Hernke Inc, and Town Bank, thank you for supporting our event. We hope you all have a great holiday season. Come 2018, we will be in full preparation mode for the spring! Following our National Championship win, Fox 6 News Milwaukee came down to feature our very own Kaitlyn Ripple as this week’s High School Hot Shot. Click Here to watch the clip. Thank you, Mickie Leach, for coming to visit us! 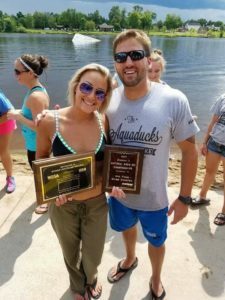 The Brown’s Lake Aquaducks are excited to announce their 2017 Division II National Water Ski Championship! Hosted by the Kwahamot Water Ski Club in Tomahawk, WI, the tournament featured 7 teams competing for the title. 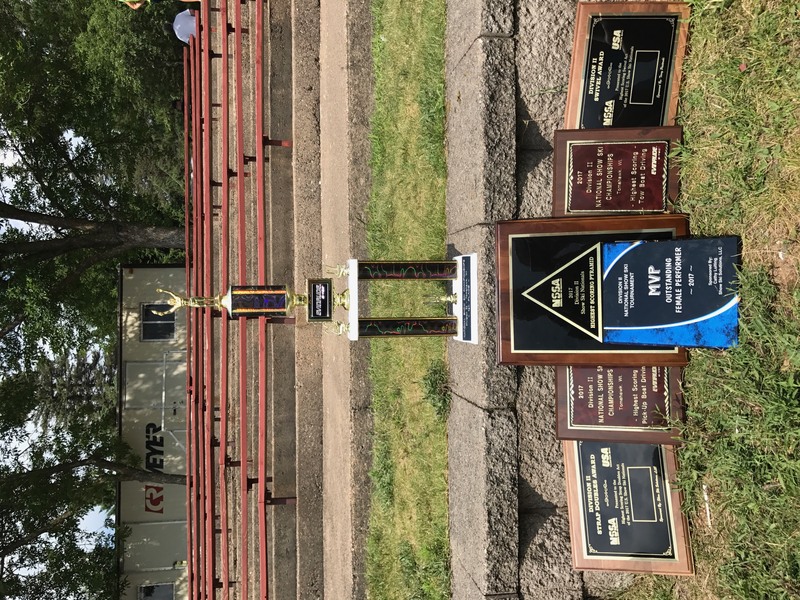 The Aquaducks tallied 1,426.77 points after earning top scores for the best Swivel Act, Pyramid Team, Doubles Act, Tow Boat driving, Pick-Up Boat Crew, Showmanship, and Comedy Act. The Aquaducks are also proud to announce that Doubles Couple Jillian Matoska and Justin Spiegelhoff ranked 2nd in the Nation after competing in the individual Doubles Competition. 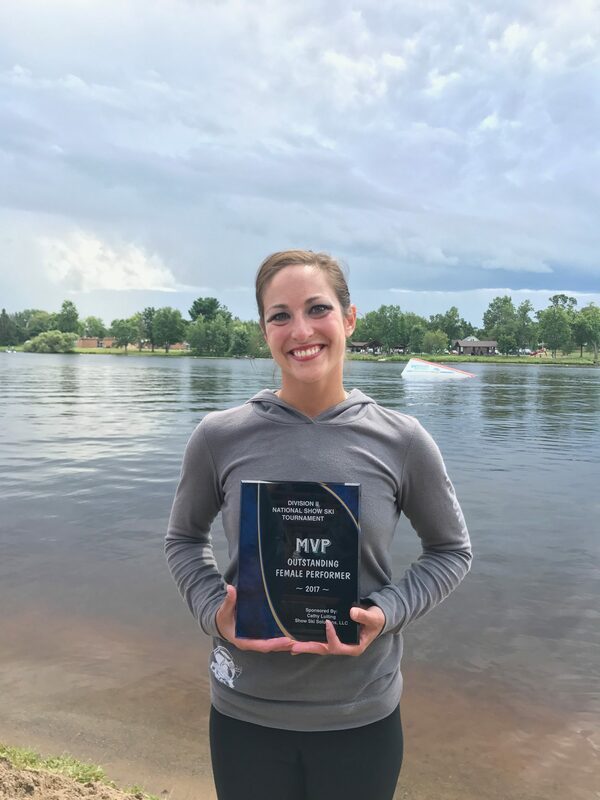 To further the achievements, Brown’s Lake Aquaduck member, Carmen Ledger, won MVP – Outstanding Female Performer of the entire tournament. 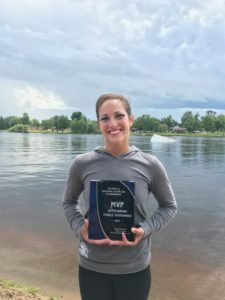 The Aquaducks are looking forward to bringing their National Champion Show back to the waters of Brown’s Lake, Burlington, WI. If you haven’t enjoyed a FREE show yet this season, make sure to catch one before season’s end, Labor Day weekend. The official schedule can be found here. To see more photos of our tournament, click here. The Aquaducks brought back a Division II 3rd place trophy from the 51st Wisconsin State Water Ski Show Championships, July 20-23, at Lake Wazeecha’s Red Sands Beach in Wisconsin Rapids, Wis. 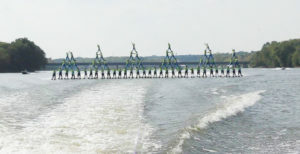 Hosted by the Wisconsin Rapids Aqua Skiers, the tournament featured 24 teams in three divisions. The Aquaducks tallied 1,367.58 points after earning top scores for the best Ballet Line, Pyramid, and Tow Boat driving. 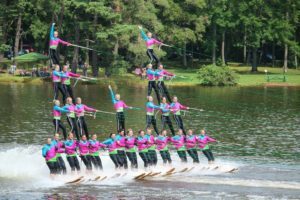 The Aquaducks are now preparing for the Division II National Show Ski Competition to be held Aug. 3rd and 4th in Tomahawk, WI. After cancelling a few home shows due to high lake levels, all remaining home shows are scheduled to perform as usual. Click here for a full show schedule. The equipment truck for our team has reached its lifespan. We are able to drive this only a few short miles at a time, but we are not able to travel our equipment to tournaments, or any off-site events. To prepare for our 2017 season, we have launched a “Duck Truck Fund” to help raise money for a new truck. If you would like to help contribute to our new truck, please click on the donation button below. If you would like to learn more about our team, before donating, please click here. Once again, the WI State Water Ski Tournament came and went in a blink of an eye. 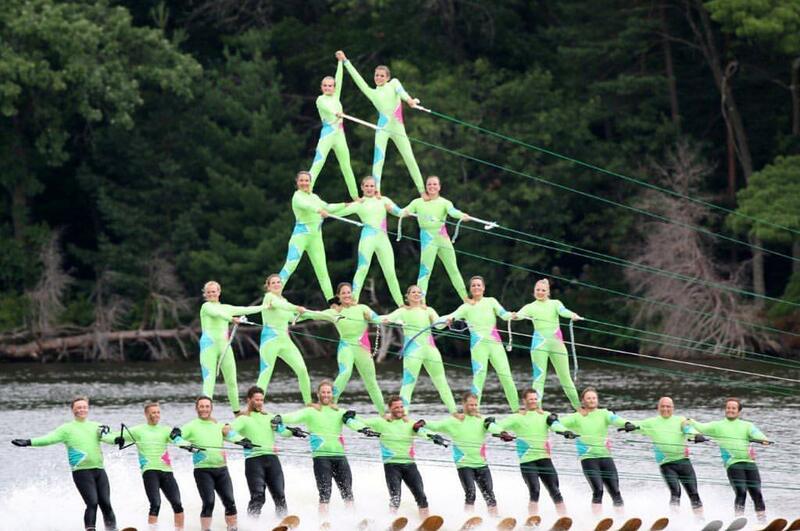 The 50th annual competition was yet another fun event, and The Ducks brought a beautiful, solid pyramid on the water. The Double-Top 4-high Pyramid won the highest scoring pyramid in Division II! 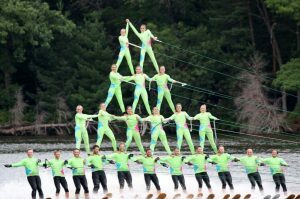 22 people strong, The Ducks were able to successfully climb the pyramid with a mile to spare, before entering the show course. The overall show brought home a 3rd place trophy, with 286 points shy of first place. While The Duck’s won’t be able to travel to the National Tournament this year, they are not finished here. The team is continuously working on growing bigger and better. Make sure to catch a show before the season is over. Only 5 more weeks left!